This week, we were pointed towards a rather insightful article about a piece of psychological research by one of our partners in Belgium, Dirk Terryn. 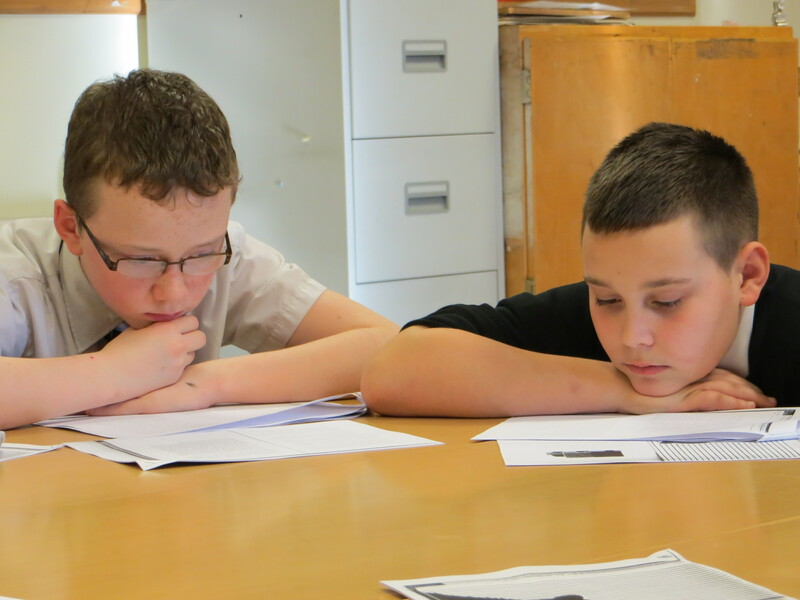 Dirk has been part of our ongoing work in developing a shared reading partnership with the city of Antwerp and the wider region of Flanders, led by the city council’s education service, which has played a huge role in taking the work of The Reader Organisation to an international level. The research, which was carried out by the Association for Psychological Science (APS) and published in their journal Psychological Science, focused on the prevalence and tendency of implicit prejudice; particularly across different cultures and ethnicities. The article (which can be read here) describes how this sort of prejudice is often caused by a lack of knowledge or lack of understanding about a particular (or indeed, several) culture(s), and how the APS research showed that increased connection and exposure to members of a cultural group is likely to decrease our prejudice towards it. More specifically though, the research showed that even a brief opportunity to take part in another’s culture can vastly improve intergroup attitudes, even months down the line. Cues for participation or connection as small or insignificant as, for example, a shared birthday, have been shown to bring people together, eventually even leading them to share common goals and motivations. In a way, this is what The Reader Organisation is trying to achieve through Get Into Reading, our shared reading scheme that takes place in a variety of settings throughout the country, every day and every week. The bringing together of people from various backgrounds and walks of life to sit within a small group of about 5 – 8 people is what, first of all, creates an opening; an opportunity for communication and social connection between those very people. After that, the various perceptions and meanings that are often steadily teased out from the text which the group may be reading is the second step. 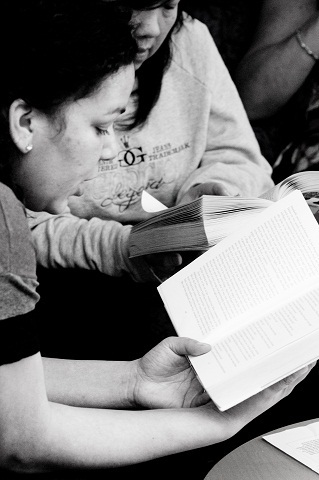 This is essentially the creating and strengthening of shared meanings, often across social and cultural boundaries , which is what Get Into Reading is all about. Members of a group can and often do find that they have things in common, which inevitably leads to social relationships being forged outside of the group. And over longer periods of time, many begin to share personal feelings or anecdotes that are unwittingly brought to the surface by the nature of the various texts. The researchers at APS do note, however, that the positive effects of the study are very much dependent on people feeling that they have “freely chosen to participate and engage in cultural activities”. Making people feel obligated to take part can, therefore, reduce these benefits and even possibly have an adverse effect. 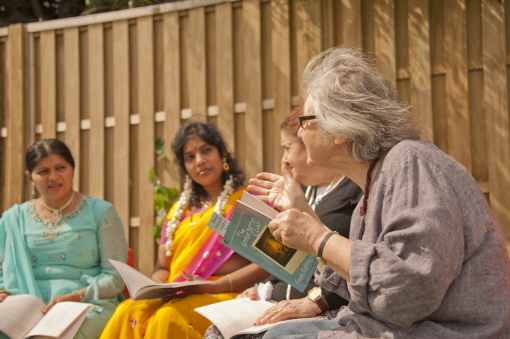 Group members are not encouraged to participate in Get Into Reading groups with the aim or motive to improve their understanding of another’s culture. Reasons for attendance at a GIR group will obviously vary massively for many people, being highly dependable on the setting, nature and purpose of the group; not to mention the personal reasons of the readers themselves. But multicultural interaction does take place regularly across GIR groups, and is without a doubt one of the most valued benefits. It’s nice to arrive and be greeted with such kindness. The reading of fragments that are then discussed at a not-too-big a table with a cup of tea in hand creates an intimate atmosphere conducive to sharing impressions, feelings and experiences. Our coordinator, Val (also Penny and others), plays a key role as she keeps the cadence, encourages us to talk, touches points to develop and contributes, like the others, with her personal experiences that enrich the conversation. Val’s high intelligence, skills and sensitivity make it a particularly pleasant and interesting experience. My group has been very generous to me and Val and the other members take the time to explain to me what I might miss because English is not my native language, because I did not grow up here, or for whatever reason. The time shared has favoured the development of personal relationships and more than once I have found myself sharing concerns as well as good and bad personal news. We may perhaps say then that multicultural interaction is a secondary outcome, or ‘byproduct’ of Get Into Reading…it strives to improve connections amongst people within communities, which may or not include those from contrasting social and cultural backgrounds. This is the beauty of Get Into Reading – the fact that no two groups are ever the same in their composition, and the fact that new and unforeseen outcomes are making themselves known all the time. Reducing implicit cultural prejudice may just be another of these many wonderful outcomes. While it is perhaps not always the aim, it is certainly always most welcome. This week’s Featured Poem comes from Welsh favourite Gerard Manley Hopkins, who is regarded by many readers as the greatest Victorian poet of religion, nature , and melancholy. As a painter, he is known for his particular technique of ‘wordpainting’ – to use language in such a way that it creates strong imagery and is vivid and often sensuous. He is also renowned for implementing his own rhythmic poetic structure – “sprung rhythm” as he called it. Hopkins is said to have been especially fond of the beautiful Elwy valley in the Snowdonia region of North Wales. His poem, In The Valley Of The Elwy is an almost ‘ode’ to this place, and the feelings he experienced when he spent time there of being at one with nature and the world. As you know, Calderstones Mansion will soon be opening its Garden Theatre for the first time in 30 years, to none other than Shakespeare’s Globe‘s touring production of King Lear! Everyone at TRO is getting jittery with excitement, and already a huge portion of tickets have been sold. So get yours quick! For those of you who aren’t familiar, the play is the story of old King Lear, who proposes to give up his crown and divide his kingdom between his three daughters. However, his rash generosity is cruelly repaid when he is caught in a web of lies and deceit by those closest to him, and he discovers all too late the falsity of values by which he has lived. Eventually plunged into despair and madness, King Lear is described by The Globe to be ‘a profound exploration of the human condition in all its extremes and complexity’. Joseph Marcell, who plays King Lear, calls it “just magical”. Executive Producer Tom Bird calls it “one of Shakespeare’s greatest tragedies”. So, what exactly is it that makes King Lear so popular? According to scholarly research, Shakespeare authored King Lear around 1605, between Othello and Macbeth, and three years after its highly-ranked competitor, Hamlet. Despite being set in a time far removed from its creation, its plot line reflects anxieties that would have been close to home for Shakespeare’s audiences around this time. Performance History expert Rebecca Brown believes that Shakespeare drew his inspiration for King Lear from a mixture of myth, legend and history (read more). Strangely enough (though perhaps not so strangely…) Shakespeare’s version is the only one to end unhappily. Two real-life cases that are believed to have had some influence on Shakespeare’s writing of the play include a lawsuit, in which the eldest of three sisters tried to have her elderly father declared insane so she could take control of his property. There is also the case of Mayor of London William Allen, who was treated very poorly by his three daughters after dividing his wealth among them. Men must endure their going hence even as their coming hither. Another keen theory is that Shakespeare was trying to expose the fragility of Elizabethan society in England, which demanded that absolute deference and respect be paid to not just the wealthy and powerful, but to parents and the elderly. The suffering of Lear and Gloucester at the hands of their own children demonstrates how vulnerable parents can actually be. So be good to your folks, kids! Tickets for King Lear at Calderstones can be bought via The Globe Box Office website or by calling 020 7401 9919. Find out more here. 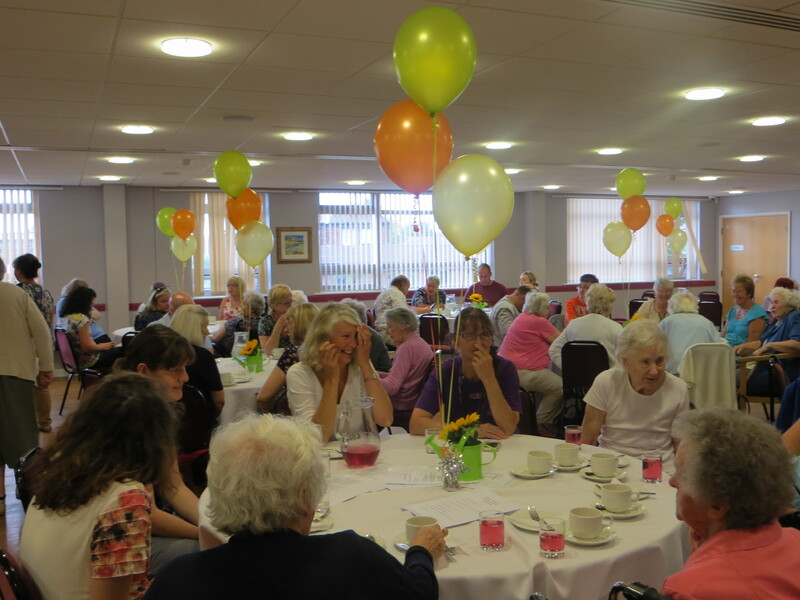 On Wednesday 24th July, many of our excellent volunteers from within the North West gathered together to enjoy a lovely summer’s day afternoon tea at the Lauries Centre in Birkenhead. 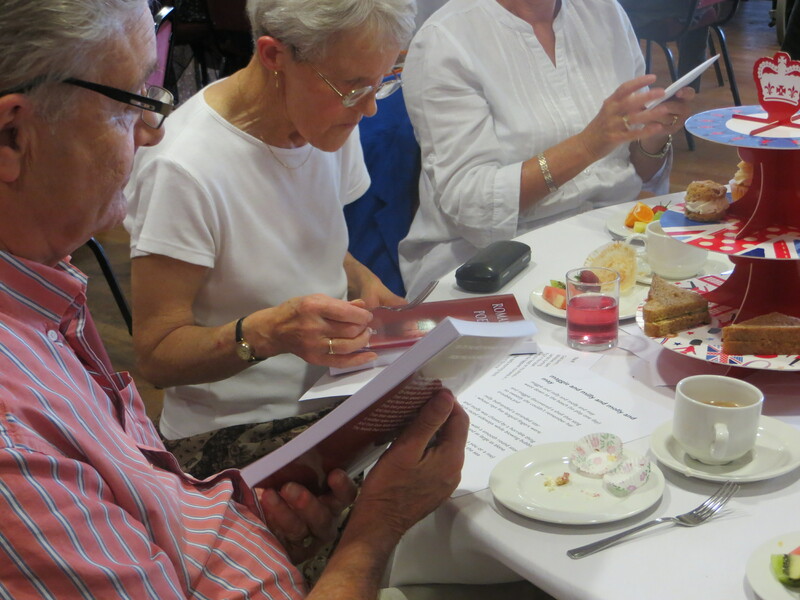 Also present were many of the people they read with from residential care homes around the region. The event was a perfect opportunity for everyone to mingle outside their reading groups, enjoying sandwiches, cake, and of course, poetry! 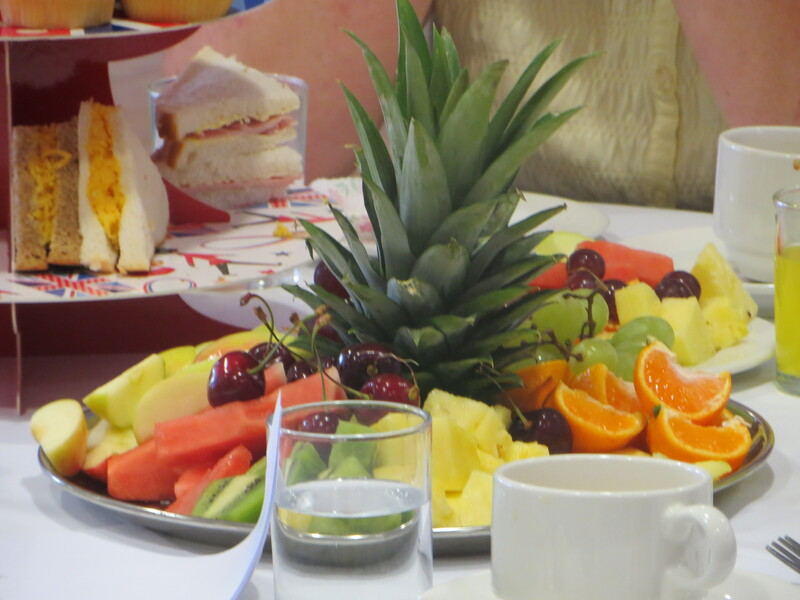 refreshing juice were served upon arrival, as well as cups of tea, and the volunteers and group members were able to settle themselves in and enjoy a nice catch up before the activities began. Anna, our Volunteer Coordinator, gave everybody a warm welcome and kicked things off with a poem. 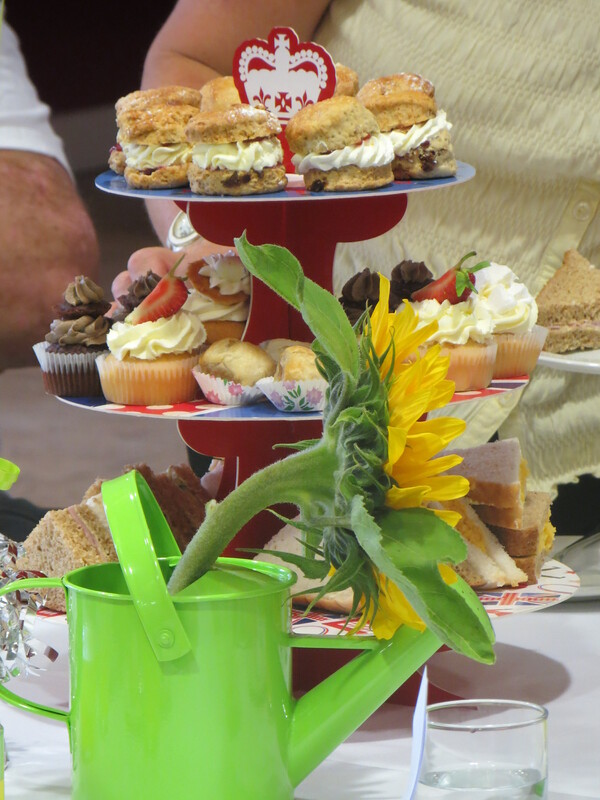 Soon afterwards, the food was served, and the guests were able to enjoy a delightful array of adorably intricate cakes and sandwiches, complete with bowls of crisps and rich platters of delectable fruit (I wouldn’t have been able to concentrate on the poetry!). As everyone ate and talked together, various guests were invited to have a go reading some poetry out loud, bringing the bustling room to a momentary hush at regular intervals. 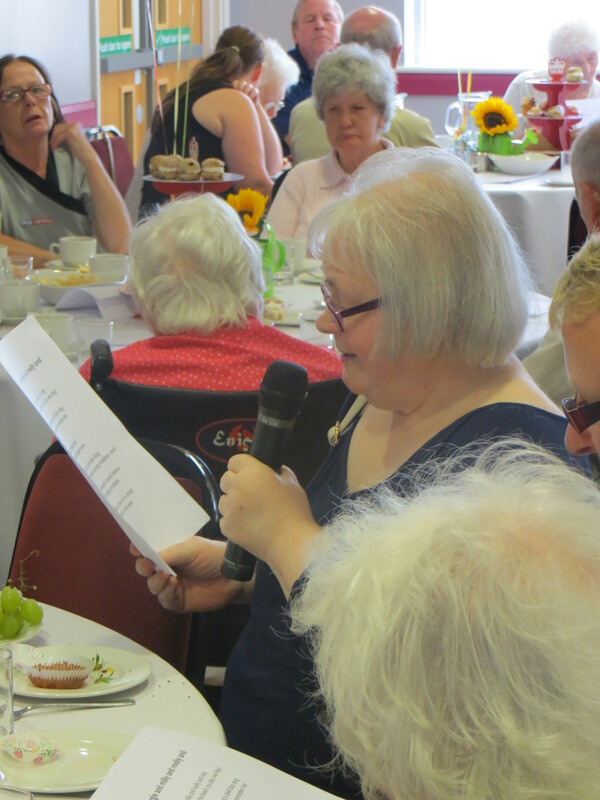 This involved both the volunteers and the group members, and it was really wonderful to see how some of the older residents were keen to take their turn, delivering their chosen poem with enthusiasm and expression. This ongoing combination of good literature and good food made for happy brains and tummies, and naturally everybody was in high spirits. As the tiers of food gradually got lighter, the guests were given some anthologies, including Emily Browning’s Romantic Poetry and, of course, our very own A Little, Aloud, Poems To Take Home and Minted. 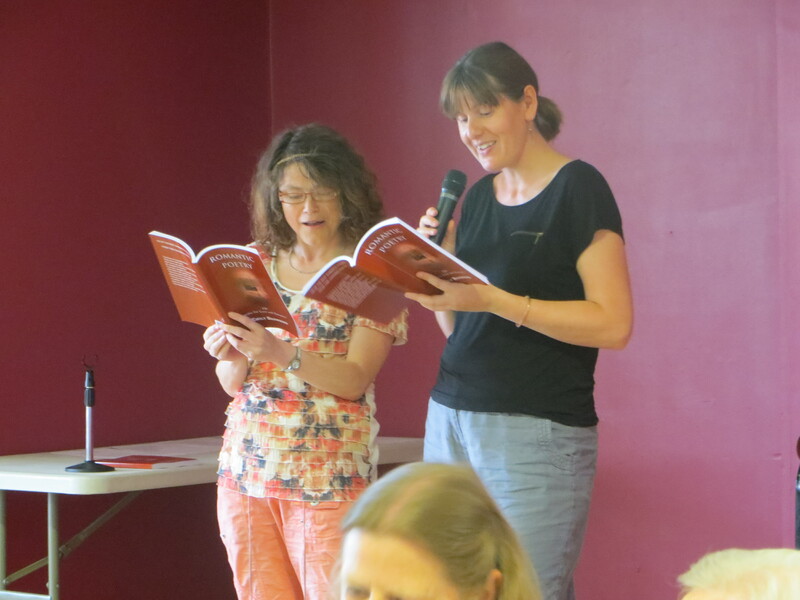 The activity of shared reading continued as people volunteered themselves to read aloud from the front of the room. One poem was the famous The Owl and The Pussycat by Edward Lear, which had everybody joining in in a great choral fashion! If anything, the afternoon was a wonderful chance to see some of TRO’s volunteers out of their usual role and find out what they love about being a part of The Reader Organisation. Many of them spoke unhesitatingly about the joy and fulfillment they get from volunteering, and the increased insight and awareness it has brought into their lives. Below are a few of our favourite quotes from the day. I’ve had parts of my life that have been really bad. But I love life at the moment, and I just want to show other people that a book can bring you a lot of happiness. Volunteers can tend to feel a bit isolated, but here that’s not the case. It’s impossible to feel isolated when you’re a part of The Reader Organisation. Their faces light up when we walk in. They look forward to that hour. And when we leave, after being with a group, we feel great ourselves. It’s been the best move we ever made. Its a marvellous organisation. I like that when you leave the room, the whole atmosphere is usually very different to when you went in. I particularly enjoy meeting people who I’d never have come across at any other time in my life. Spending time with them; learning about other sides of life that I knew nothing about. There’s been quite some focus in the news recently about the wonderful activity of reading for pleasure, and worries about whether our children are doing enough of it. A research study funded by publishing group Egmont was reported by The Guardian to suggest that today’s parents’ increasingly busy lifestyles are preventing them from having the time to actually sit down and read to their children usually after the age of five. Meanwhile, teachers argue that due to the target-driven policies of education today, they do not get time to instil a genuine love of reading in the children they teach, and introduce them to a variety of books. This means that our younger generations are missing out on one of our greatest human pleasures, and no doubt growing up with an inhibited appreciation for language and its creative power. 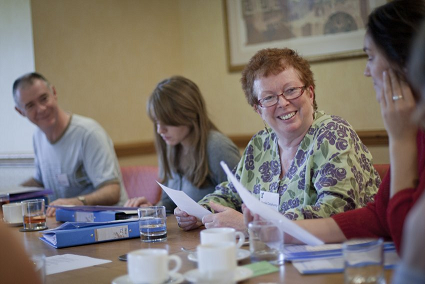 In December 2012, The Reader Organisation held a Reading For Pleasure In Schools Day Conference, a successful event that focused on strategies to engage primary and infant school children in reading for pleasure. That means no testing, no grades, no pressure for the child…just pure, plain, enjoyment. Over 50 teachers and teaching assistants from across Merseyside were in attendance, along with special guest speakers Frank Cottrell Boyce and two representatives from Walker Books UK. It ended with a consultation session where teachers gave their opinions on what would enable them to turn their school into a ‘Reading Revolutionary School’. Now, we’re focusing on secondary school pupils. Our upcoming Reading For Pleasure in Secondary Schools Day Conference will be taking place next Monday 15th July at Liverpool Hope University, and we hope that you will join us. It is one thing to get primary school children to read, an age group whose imaginations are still fluid, excitable, and naturally curious. It is quite another to engage secondary school pupils, who are at a greater risk of losing connection with literature because of the mental space it demands, the time within their schedule it may require, and even perhaps a slight insecurity about whether reading is indeed a ‘cool’ thing to do. During this conference, The Reader Organisation will be exploring how exactly we can encourage adolescents to read more. 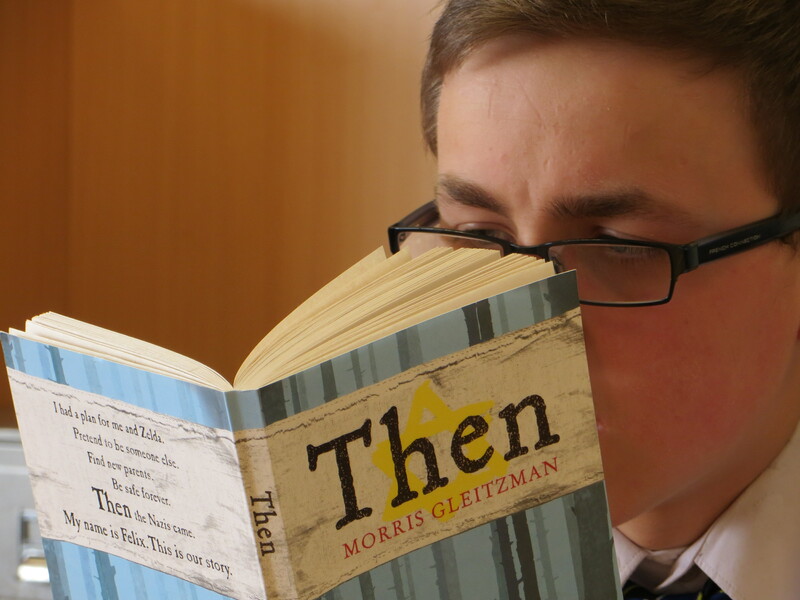 On the day you can expect a range of interactive and focused sessions, including participating in shared reading sessions based on TRO’s award-winning Get Into Reading programme, and learn more about how to encourage children to read for pleasure within and beyond the classroom. Guest speaker Frank Cottrell Boyce, best-selling author, screenwriter and patron of TRO, will be returning and answering your questions. Founding Director Jane Davis and Liverpool Hope University Reader In Residence Charlotte Weber will also be talking about The Reader Organisation’s work, and our partnership with the university. This event is FREE of charge, and refreshments and lunch will be provided on the day. You’ve probably all noticed that we’ve been talking quite a lot about Independent Booksellers Week lately, taking place this week from 29th June to 6th July. Originally organised by the Booksellers Association in 2007, IBW celebrates and supports independent bookstores everywhere! It encourages readers to explore and become better-acquainted with their local indie bookstore, in the hope that they will find a reason to shop there more frequently instead of at the usual high-street chains. IBW helps to ensure that these increasingly elusive cultural gems do not become abandoned or worse, extinct. Since Amazon’s recent tax-avoidance escapade, many consumers – that includes readers and authors – have admitted to being driven more towards shopping at indie bookshops to get their literary fix. Why is this? Perhaps they feel it is a more honest, pure way to shop; maybe they like the uniqueness, the exclusivity of it all…or maybe its the special exchange that takes place between bookseller, who cherishes books almost like a faithful collector, and avid reader, who often secretly wishes to be said collector. Overall, a strong sense of community is created by the presence of independent shops and traders, and according to Kate Mosse, just one of this year’s IBW’s many literary advocates, independent booksellers do this beautifully. So far, IBW has been supported by the likes of David Walliams, Eoin Colfer, Nick Sharratt, Alan Bennett, and dozens of others, and many have been rolling up their sleeves and getting stuck in this week to show their fans the many perks of shopping the indie way. 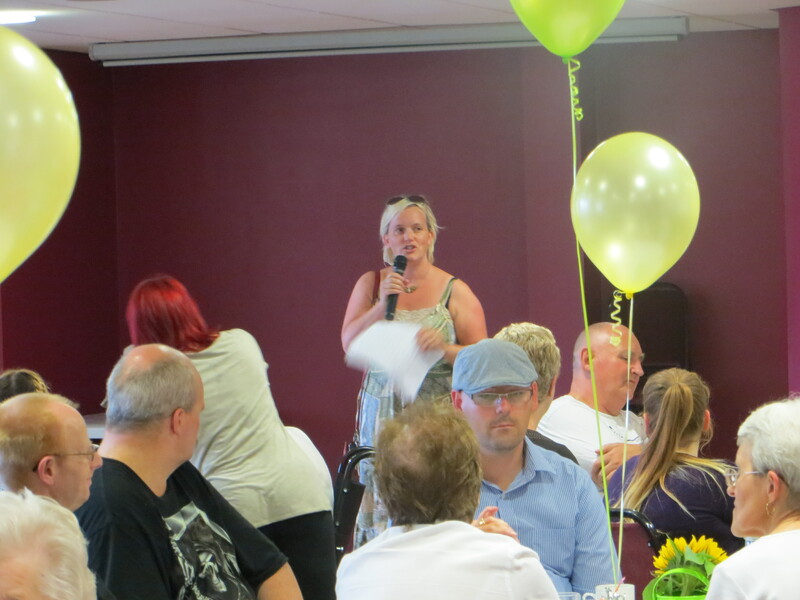 IBW began with National Reading Group Day on 29th June, which celebrated everything to do with reading groups and the benefits they can bring for people everywhere. Since then, the Annual Independent Bookseller Awards took place, awarding US authors Ruth Ozeki and RJ Palacio their very first UK literary awards, decided by independent booksellers. Then there was the Southbank Centre Debate on 3rd July in London – a talk reflecting on booksellers’ fight for the high street, involving writers Kate Mosse, James Runcie (Head of Literature at Southbank Centre) and Anne Sebba, (Chair of the Society of Authors). AuthorFest sees Mosse, along with fellow authors Malorie Blackman, Anthony Beevor and Ann Widdecombe appear in their own local bookshops to share their thoughts on supporting the trade. Widdecombe is also participating in Strictly Come Bookselling, which involves authors stepping behind the counters of local bookstores, perhaps surprising a fan or two! The Telegraph offers a good overview of all this week’s key dates right here. Want to get involved? Then make the most of this fantastic period in your literary calendar, and attend a local bookstore today! Below are some of our favourite bookstores across the nation. If you’re situated in or near any of these locations, be sure to pop in (and don’t forget to pick up a copy of The Reader Issue #50 when you do)! Alternatively, you can search for your own nearest indie bookstore here. You can let us know about your favourite independent bookstore and what it is you love about it by leaving a comment here, on Twitter or Facebook.